A diagram of local acceleration caused by chorus events. The top panel shows electron fluxes before (left) and after (right) a magnetic storm. Introducing low-energy electrons into the radiation belts (1) causes the chorus waves to become excited (2) and causes phased space density just outside of the plasmasphere (3). Accelerated electrons can travel inward toward Earth or outward into space (4). Waves in the plasma trailing behind Earth are responsible for making the northern lights dance in the sky, but according to new research, they also create another cosmic wonder. Known as chorus waves, these oscillations also cause the rapid acceleration of electrons already trapped in the planet's radiation belts. The fluctuations occur in the very low frequency range, but can send charged particles spiraling into the atmosphere at velocities approaching the speed of light. Observations of a high-energy geomagnetic storm last year by NASA's Van Allen Probes allowed Thorne and his team to confirm the process. On October 8 and 9, 2012, two interplanetary magnetic clouds collided with Earth's magnetic field. 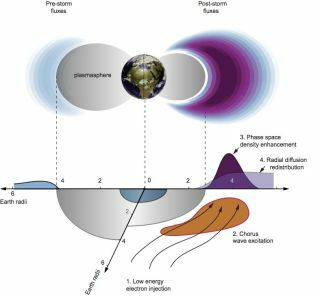 The storm sent electrons from the plasma permanently trapped on the night side of Earth spiraling onto the dayside, ultimately scattering in the planet's atmosphere. Plasma sheets of trapped solar wind material regularly trail behind Earth at a distance of approximately 10 times the planet's radius. Electrons in the sheet take a small amount of energy from the solar wind, but otherwise remain fairly stable. "But when there is a strong energy injection from the solar wind into the Earth's magnetosphere, the plasma sheet electrons are further energized as they are driven into the inner magnetosphere by strong convection electric fields," Thorne told SPACE.com via email. Thorne and other scientists suspected the electrons were energized by a phenomena known as chorus waves. Chorus waves in Earth's electromagnetic field have been studied for decades, both from Earth and with satellites. The intriguing waves create sounds that can be picked up at radio wavelengths.They are responsible for scattering lower-energy electrons into the atmosphere to create aurora in the sky. But for years, their acceleration of electrons to relativistic speeds was only a theory. According to the theory, the low-frequency chorus waves could resonate and exchange energy with electrons trapped in the radiation belts. Excited by the low-energy population, the waves then give energy to the electrons, either sending them into the atmosphere or propelling them at near-light speeds. "The resonant process is similar to the way a surfer can gain energy from a wave," Thorne said. In October, energy from the geomagnetic storm caused a spike in electron acceleration, allowing Thorne's team to identify peaks in the heart of the radiation belt that were inconsistent with other possible methods of electron acceleration, using what he called "the unprecedented high resolution electron data taken by the Van Allen Probes." "While chorus is common, the level of solar wind driving is not," Mary Hudson, of Dartmouth College, told SPACE.com by email. Hudson, who studies the Van Allen radiation belts and space weather, authored a corresponding News & Views piece that appeared with Thorne's research, which she was not involved with. Both pieces were published online today (Dec. 18) in the journal Nature. "This was the strongest MeV [megaelectron volt] electron acceleration event since the Van Allen Probes launch," she said. A megaelectron volt is equal to 1 million electron volts, or 1 million times the energy required to move an electron through a potential of one volt. Using the data from the Van Allen Probes, Thorne and his team developed a new dynamic global model for the intensity of the chorus waves. Their simulations demonstrated that the observations could be precisely explained by local chorus acceleration. The twin Van Allen Probes orbit in Earth's inner and outer radiation belts. Launched in August 2012, the twin Van Allen Probes travel through the donut-shaped radiation belts surrounding Earth. Driven by energy and material from the sun, the two belts swell and shrink constantly over time, sending out charged particles into space or down into Earth's atmosphere. The Van Allen Probes sit in this dangerous region, monitoring changes in space weather. Radiation belts are not limited to Earth, however. Thorne said most magnetized planets contain radiation belts, while scientists have observed chorus emissions in the belts of both Jupiter and Saturn. "Currently, there is no adequate explanation for the relativistic electrons in the Jovian magnetosphere," Thorne said. Chorus waves could be the missing component for Jupiter's fast-moving electrons. "We believe that the local wave acceleration process described in our Nature paper is universal, and could occur in other magnetized objects in the cosmos," he said.